HOUSTON (ICIS)--US epoxy resins continue to be pressured up by tight supply and high import prices, much like in the first quarter. The ICIS US liquid epoxy resin contract price had a significant increase of 31 cents/lb ($683/tonne) during Q1 2018. Meanwhile, market players said most of the 10-12 cent/lb price increase initaitives appear to be going through this month, setting the stage for another rise in the contract price. "I see [epoxy] resin and feedstock pricing going up," a source said. Prices in Asia have remained at or near the record high of $3,000/tonne for all of this year, putting upward pressure on imported material. "Spot import prices remain firm, " a source said. "But prices should go down in the near future." Imported material has been quoted in the mid-$1.40s/lb, with some sources seeing higher prices in the $1.50s/lb, though this is not market-wide. However, a gap appears to be re-opening between domestic and imported material, as some sources have noted that prices for domestic material is higher. As a result, producers in northeast Asia are expected to continue sending cargoes to the US as they anticipate greater netbacks. Demand from the coatings sector for epoxy resins generally starts to pick up in the second quarter. But persistent winter weather, especially in the northeast where snow and freezing temperatures have been seen this month, is likely delaying the start of the peak coatings season. Looking ahead, demand is expected to be strong, with much of it attributed to reconstruction activity in parts of the US that were impacted by hurricanes and wildfires in 2017. As a result, the markets are not expected to see downward momentum, keeping the situation challenging for buyers. "The markets are volatile," summed up a source. 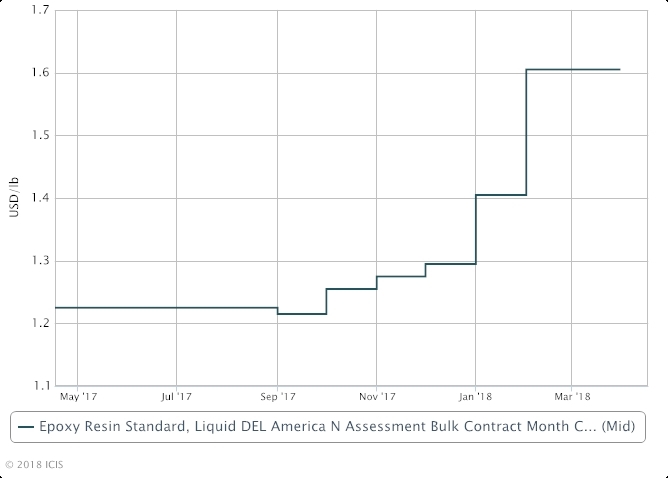 ICIS had assessed the US March liquid epoxy resin contract price at $1.58-1.63/lb DEL (delivered) North America.